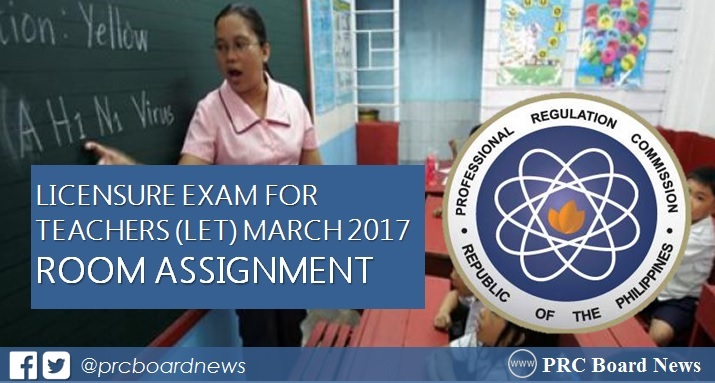 (Updated March 21) The Professional Regulation Commission (PRC) and the Professional Regulatory Board for Professional Teachers (BPT) officially released room assignment for Sunday, March 26, 2017 Licensure Exam for Teachers (LET) or teachers board exam. Check out on this page for the alphabetical list of room assignment per testing center. According to PRC Resolution No. 2016-1019 series of 2016, the March 2017 LET shall be conducted in Manila, all regional offices, and including Zamboanga, Bacolod, Rosales, Pangasinan and General Santos City. Last January 24, PRC announced the inclusion of Catarman, Northern Samar and San Jose, Occidental Mindoro as additional testing centers for March 2017 LET in view of PRC Resolution No. 1025, series of 2017. Meanwhile, pursuant to PRC Resolution No. 1028, series of 2017, Puerto Princesa, Palawan was also added as testing center for the upcoming teacher's board exam. This was announced on February 1. Note: The full list of room assignment is expected to be available online in a week before the licensure examination. The first licensure exam for teachers this year covers general education and professional education subjects (Elementary Level) and with the inclusion of specialization for Secondary Level only. NOTE: PRC Board News will also update this site for the results of March 2017 LET.